This Starplast Utility Cabinet is the perfect storage solution for your outdoors. It is made from weatherproof, heavy duty polypropylene which makes it both durable and rust-free. A great addition to the garden, garage or patio, this Utility Cabinet is made from tough, durable heavy duty plastic and weather proofed to prevent rusting all year round. The Utility Cabinet comes flat-packed and can be assembled in minutes without the need for tools. The Utility Cabinet has a lockable heavy duty hinged lid keeping the contents within safe and secure. 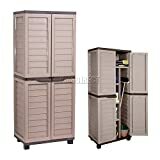 This entry was posted in Home Decor Supplies and tagged 11811, Cabinet, Chocolate, Free, Garage, Garden, Mocha, OUTDOOR, Partition, Plastic, rust, Shed, shelves, Starplast, Storage, Unit, Utility by 4logis. Bookmark the permalink.